Fat Fish Games’ ‘Tiny’ sports franchise has expanded yet again across iOS and Android devices, as Tiny Tennis joins previously released games Tiny Goalie and Tiny Touchdown on mobile. The Tiny Tennis app challenges gamers to move their tennis player across the top of the screen to hit a tennis ball to the other side of the net. Like its predecessors, Tiny Tennis is a survival experience, asking users to return as many serves as possible without missing a shot. As players earn points, their combo meter rises and the tennis balls start flying at a faster pace to increase the challenge. Eventually, water bottles join the mix, and must be avoided to continue playing. Outside of matches, players have the option to purchase an app upgrade, unlocking nine different tennis court designs, and removing ads from the experience. Elsewhere, gamers can track their stats, including total number of games played, total number of balls hit and missed, and more. “Following the huge success of its predecessors, Tiny Goalie and Tiny Touchdown, we have brought more tiny pixelated fun to another popular sport, tennis. 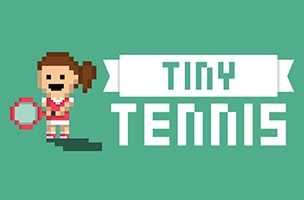 I love arcade games and tennis games in general, but there aren’t many good tennis games available on the App Store, so I wanted to create a simple and fun tennis game that I would enjoy playing!” said Anthony Barker, developer of Tiny Tennis. Tiny Tennis is available to download for free on iOS and Google Play. Check back soon to follow the game on AppData, our tracking platform for mobile and social apps and developers.